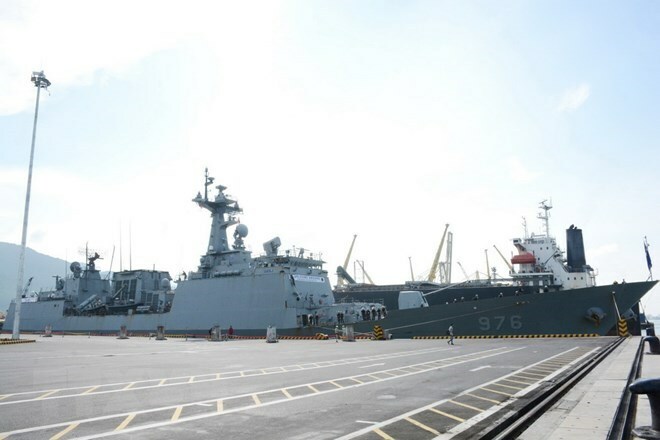 Da Nang (VNA) – The Republic of Korea Navy’s destroyer anchored at Tien Sa port in Da Nang on September 11, beginning its four-day visit to the central city. Attending the welcome ceremony for Destroyer ROKS Moon Mu The Great included leaders of the High Command of Vietnam's Naval Region 3, Defence Ministry’s Department of External Relations and Da Nang’s Military High Command, together with the RoK’s Ambassador to Vietnam Kim Do-hyun, and Defence Attaché Ryou Jae Guen. During their stay, the ship’s officers and crewmembers will pay courtesy visits to leaders of the municipal People’s Committee and the High Command of the Naval Region 3. Before leaving the Tien Sa port on September 14, the destroyer will participate in a joint team formation and communication exercise with the Vietnamese Navy. The joint exercise aims to promote defense cooperation between the two countries and help strengthen regional unity in the maintenance of security, safety and freedom of navigation. This is the second visit by a RoK naval ship to Da Nang. ROKS Moon Mu The Great is a Chungmugong Yi Sun-sin-class destroyer commissioned in 2004. The ship is 150 meters (492 feet) long with a beam of 17.4 meters, draft of 9.5 meters, displacement of 4,400 tons and a maximum speed of 30 knots (35 miles per hour) with a range of 10,200 kilometers.